On April 22, the idea that oil painting was invented in Europe is overturned by a remarkable discovery made as a result of one of the worst examples of cultural vandalism in recent years. In 2001 the Taliban destroyed two ancient colossal Buddha statues in the Afghan region of Bamiyan, around 140 miles northwest of Kabul, which were hewn out of sandstone cliffs in the third century and, measuring up to 55 metres, were the biggest of their kind. The action drew international condemnation. Scientists have proved, thanks to experiments performed at the European Synchrotron Radiation Facility (ESRF) in Grenoble, France, that the paints used were based of oil, hundreds of years before the technique was "invented" in Europe, when artists found they could use pigments bound with a medium of drying oil, such as linseed oil. However, the murals found on cave walls in Afghanistan prove that painting with oil had been going on in Asia for centuries before artists used the technique in Europe. In many European history and art books, oil painting is said to have started in the 15th century in Europe. But the team that used the ESRF, an intense source of X rays, found the Bamiyan paintings date back to the mid-7th century AD. The murals show scenes with Buddhas in vermilion robes sitting cross-legged amid palm leaves and mythical creatures. Other motifs show crouching monkeys, men facing one another or palm leaves delicately intertwined. 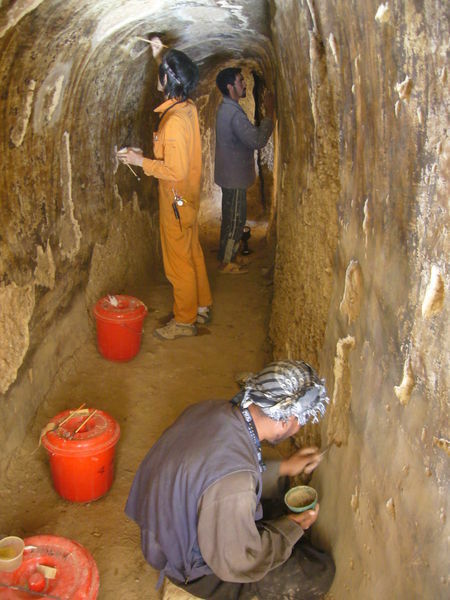 A dozen out of the 50 Bamiyan's caves, in which monks used to live and pray, were painted with oil painting technique, using perhaps walnut and poppy seed oils, concludes Ms Yoko Taniguchi from the National Research Institute for Cultural Properties in Tokyo, working with an international team from the Centre of Research and Restoration of the French Museums-CNRS (France), the Getty Conservation Institute (United States) and the ESRF. "This is the earliest clear example of oil paintings in the world, although drying oils were already used by ancient Romans and Egyptians, but only as medicines and cosmetics", explains Ms Yoko Taniguchi, leader of the team of scientists. "My European colleagues were shocked because they always believed oil paintings were invented in Europe. They couldn't believe such techniques could exist in some Buddhist cave deep in the countryside." A combination of techniques to study the paintings was crucial to conclude that oils were used, says Dr Marine Cotte, a member of the team. "We needed different techniques to get the full picture". The scientists employed a combination of synchrotron techniques such as infrared micro-spectroscopy, micro X-ray fluorescence, micro X-ray absorption spectroscopy and micro X-ray diffraction. "On one hand, the paintings are arranged as superposition of multiple layers, which can be very thin. The micrometric beam provided by synchrotron sources was hence essential to analyze separately each of these layers. On the other hand, these paintings are made with inorganic pigments mixed in organic binders, so we needed different techniques to get the full picture" Marine Cotte, a research scientist at CNRS and an ESRF scientific collaborator explains. 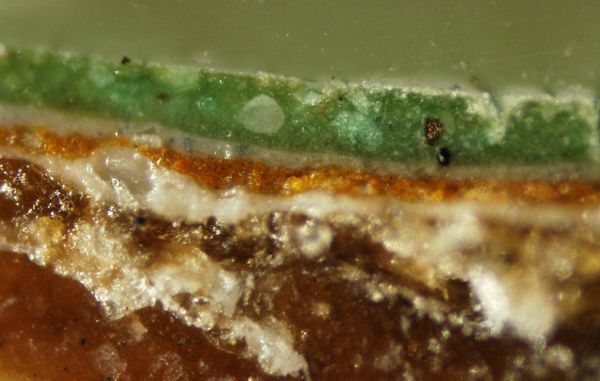 The beams separated out the layers of paint, and the different techniques allowed researchers to analyze the variety of materials. The results showed a high diversity of pigments as well as binders and the scientists identified original ingredients and alteration compounds. Apart from oil-based paint layers, some of the layers were made of natural resins, proteins, gums, and, in some cases, a resinous, varnish-like layer. Protein-based material can indicate the use of hide glue or egg. Within the various pigments, the scientists found a high use of lead whites. These lead carbonates were often used, since antiquity up to modern times, not only in paintings but also in cosmetics as face whiteners. Bamiyan, about 130 kilometers (80 miles) northwest of Kabul, was once a thriving center of commerce and Buddhism. The paintings are probably the work of artists who travelled on the Silk Road, the ancient trade route between China, across Central Asia's desert to the West. Other early civilisations including those in current-day Iran, China, Turkey, Pakistan and India may have used similar techniques as well but their ruins have not been subject to the same battery of studies. 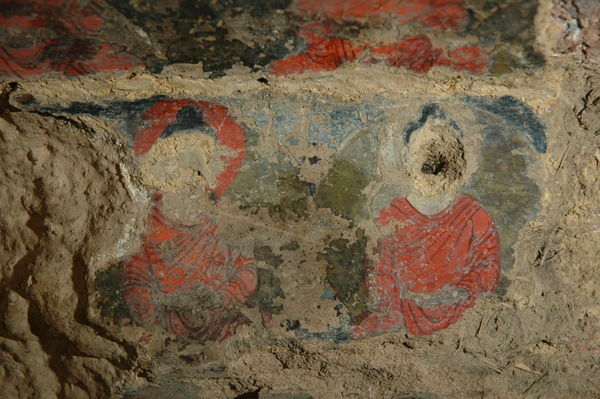 We were fortunate to get the opportunity from UNESCO, as a part of conservation project for the World Heritage site Bamiyan, to study these samples and we hope that future research may provide deeper understanding of the painting techniques along the Silk Road and the Eurasian area, says Taniguchi. The results were presented in a scientific conference in Japan in January, but are only published in the the peer-reviewed Journal of Analytical Atomic Spectrometry in April. The Taliban used dozens of explosives to demolish the Buddha statues in Bamiyan. Now, the United Nations cultural agency, UNESCO, is trying to restore the bigger of the two statues. But the mammoth task could take a decade to complete.